PilotPool.com launched today with free registration available to all pilots seeking airline employment. 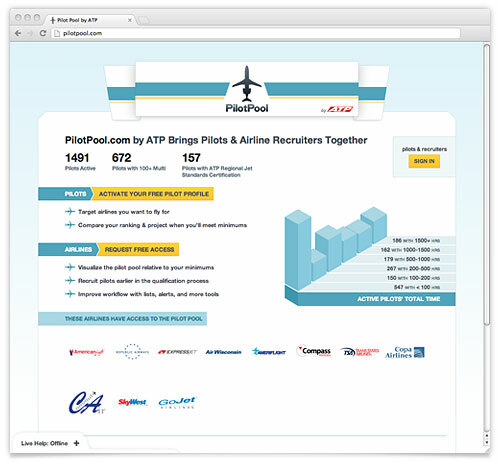 PilotPool.com is ATP's pilot recruitment tool that helps airlines visualize the pilot pipeline and access real time pilot qualification data far beyond the horizon of traditional HR application processes. Pilots gain the advantage of establishing a relationship with their target employers as they work toward meeting meeting hiring minimums. In 2011, ATP soft-launched PilotPool.com to ATP graduates and instructors while refining the application system. Now, with open registration available to all pilots, airlines will benefit from even more data about the pool of pilot candidates. ATP is further supporting its partner airlines with dedicated PilotPool.com representatives to help integrate PilotPool.com with airline workflows. Pilots setup a free profile on PilotPool.com where they enter their essential pilot qualifications and upload a resume. As pilots progress through more training and experience, airline recruiters receive notification when important milestones are reached. "As a provider of training to over 4,200 pilots every year, we know it is important to help our customers get contact with potential employers," said Vice President, Jim Koziarski. "At the same time, we know how important it is for airlines to access data on pilot supply and training pipeline. PilotPool.com brings these two sides together." With concerns of hiring shortages, solutions for finding good quality pilot candidates are needed. Many airlines are unable to see candidates until they have met hiring minimums and send in their resume which delays finding eligible pilots and prohibits a forward-looking hiring process. PilotPool.com pilots can be viewed and their progress tracked by airline recruiters, simultaneously allowing recruiters to solve for future supply and demand constraints. PilotPool.com includes a proprietary tracking program of flight times of pilots, giving airlines accurate projections of when pilots will meet minimums and be eligible for airline new-hire classes. Many recruiters find that data in their files of potential candidates is outdated and misrepresents the real status of pilots seeking employment. PilotPool.com gets airlines access to the most relevant pilot profiles for recruitment and relationship-building so airlines can meet their hiring needs over a longer term time horizon. Along with this, ATP provides partner airlines with a dedicated representative to assist with workflow integration. Partner airlines who use PilotPool.com can be assured that the information they are receiving about candidates through PilotPool.com is up-to-date. PilotPool.com is currently used by Republic Airlines and American Eagle, with other airlines actively engaged with the program. Airlines are encouraged to contact ATP for more information about how they can reach more qualified candidates for hiring through PilotPool.com by ATP. For more information, visit PilotPool.com. In 1984, ATP pioneered accelerated, professional multi-engine flight training with an emphasis on pilot career development. Today ATP's Airline Career Pilot Program prepares pilots for airline careers with nationwide flying experience in multi-engine aircraft. In partnership with the leading regional and national airlines, ATP offers its students an airline-sponsored career track from zero time to 1500 hours, with CFI job placement and airline employment. ATP flies over 9,000 hours to provide more than 350 FAA pilot certificates every month across 28 locations nationwide. As america's largest flight school, ATP provides more pilots to the regional airlines than any other single flight school, college, or academy.